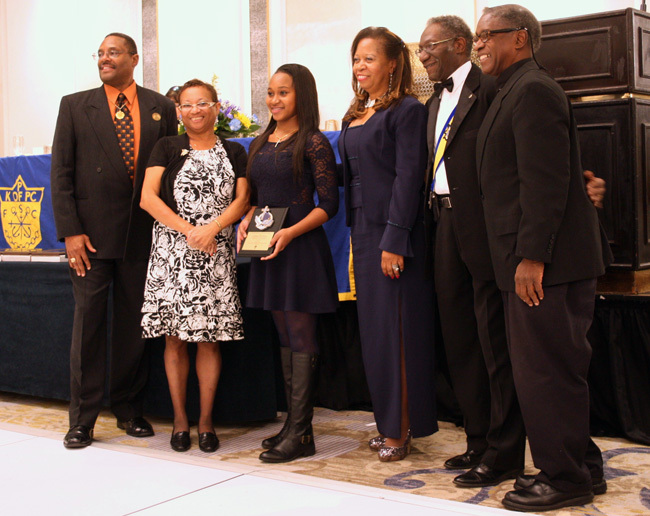 The Knights of Peter Claver and its Ladies Auxiliary drew more than 250 guests for its eighth annual Philadelphia Claver Awards Banquet Saturday, Nov. 15. Members of the Knights and Ladies as well as the Junior Knights and Ladies came dressed in black-tie finery for the gala that was held at the City Avenue Hilton Hotel. This year’s theme was “Saved by Amazing Grace” and gratitude was the resonating theme as each award was presented. Speakers noted how each of the award recipients had extended themselves by volunteering in their parishes, engaging in community outreach and sharing their gifts and talents with others. Scholarships in the form of Chaplain Awards were awarded at the banquet to Catholic high school and college students. Recipients included John Hargraves, Kimberly Hopewell, Cherokee Pindle, Brian Thomas and Alicia Thompson. 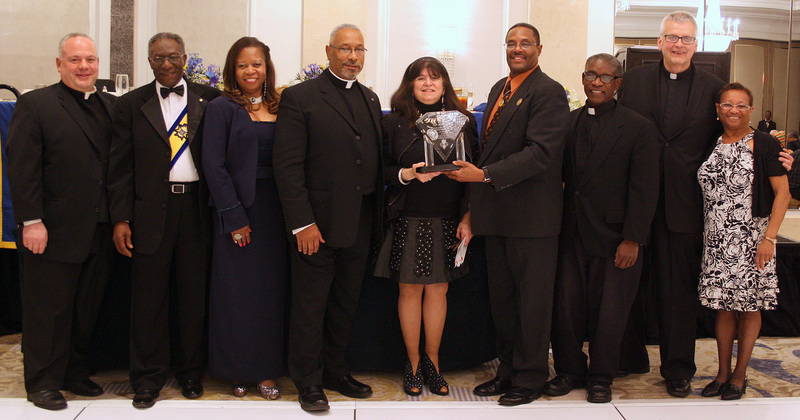 The awards were presented by Father Rayford Emmons, the group’s chaplain. “I feel really blessed to be here to see my granddaughter honored today,” said Chestnut Hill resident Rosalee Day of her granddaughter, Kimberly Hopewell. Day is a member of St. Athanasius Parish in West Oak Lane. She raised and adopted Hopewell, who is currently a student at the Community College of Philadelphia. The 2014 Philadelphia Claver Award recipient was pianist, music professor and producer of the televised Sunday Mass on Channel 6, Annette DiMedio. The Swarthmore College alumna is on the music faculty of the University of the Arts’ School of Music. She noted that Father Rayford Emmons, parochial vicar of Holy Cross Parish in Mount Airy, and Father Joseph Okonski, pastor of St. Athanasius, were among the other priests present at the gala who have appeared on the televised Mass. The afternoon’s honorees also included Maurita Brice, Stephen Cox, Blessed Sacrament Sister Stephanie Henry, Mary Kweku and LaVaida Owens-White, who were the 2014 Body of Christ Community Service Award recipients. Msgr. Wilfred Pashley, pastor of St. Barbara Parish in West Philadelphia, and Father George B. Moore, who was the longtime pastor of the former St. Benedict Parish in West Oak Lane, received the Good and Faithful Servant honors. Ted Travis, a member of the St. Athanasius community that includes St. Benedict’s since its merger in 2013, accepted the award for Father Moore. He said Father Moore was in the hospital when he learned he received the award and he was very excited about it. The program for the banquet opened with Knights’ President Leonard Brooks giving the welcome. He introduced this year’s banquet chairs Eugene Frasier and Madeline Tymes, who served as mister and mistress of ceremonies. Msgr. Britto, the group’s former chaplain, gave the blessing. Award presenters included Larry Butts, Frasier and Father Emmons. The three presided over the “Deceased Memorial Remembrance” for a dozen members from the various courts and councils who died in the past year. Father Emmons delivered the final benediction before the dance floor was opened for the remainder of the banquet. Musical entertainment was provided by Divine Sounds Mobile Disc Jockeys. The 2012-2014 Central Committee officers are Brooks, Vanessa Holloway, Elaine Green and Marvin Rouse. The local board of trustees includes Maurita Brice, Carolyn Jenkins and Carolyn Walls. In a Nov. 15 letter to Brooks, Archbishop Charles J. Chaput said that the theme, “Saved by Amazing Grace,” was timely and appropriate. “We recognize the many graces and blessings bestowed on us by God our Father,” the archbishop said. Arlene Edmonds is a freelance writer in Philadelphia.